Want to make a gift to your partner, friend or family member? Do you wish to make a gift to your partner, a friend, a family member? 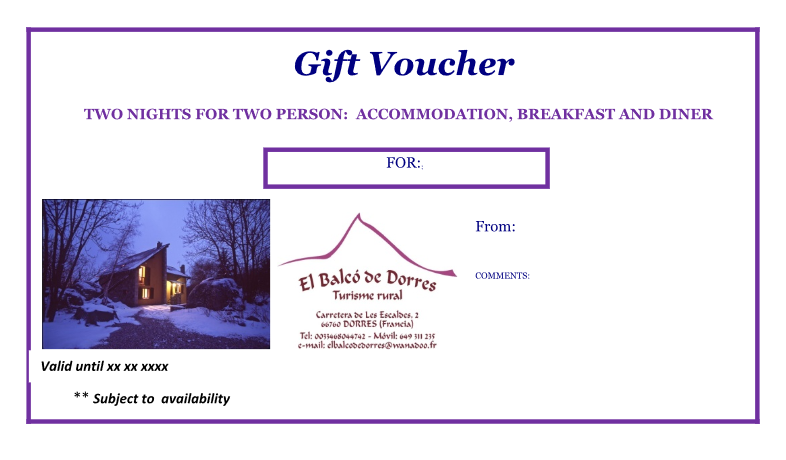 Nothing better than to offer them a stay at our B&B house “El Balcó de Dorres”. We will try as much as we can, to make their stay an unforgetable experience and he hope they enjoy so much in la “Cerdanya”. In addition, as a thank you, we’ll offer a 15% discount on the accommodation when you do next bookingwith us (subject to certain terms and conditions as detailed the voucher-discount retail). Want to make the best gift possible? Please contact us using this form or phone us !